Charles Parsons was the youngest child of William, 3rd Earl and his wife Mary. They had 4 sons who grew to adulthood, and Charles was some 15 years younger than his eldest brother who became the 4th Earl. All four of William’s sons were brought up among construction, engineering and work on the telescope so Charles was involved in practical work in the workshops at an early age. The boys were educated at home here in Birr with their brothers until Charles left for Trinity and then Cambridge, where he got an honours degree at St John’s College. There was a long tradition of what might be called engineering in the family. His father, William. self-taught in that field, produced the mechanics for lowering and raising the telescope. Charles is best known for his invention of the steam powered turbine which was used eventually to power the engines of ships. His invention of a turbine engine in 1884, making cheap and plentiful electricity possible, revolutionised marine transport and naval warfare. This turbine changed the world, and Charles can be said to be the father of the jet engine. 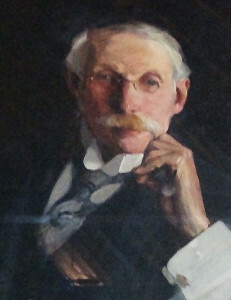 Charles Parsons realised the potential of his new turbine to power ships and in 1893 he, along with five associates, formed the Marine Steam Turbine Company. 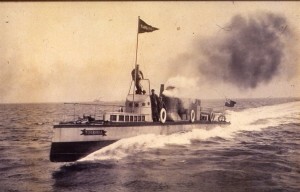 It was decided that the first experimental vessel be named Turbinia. The vessel was 104 feet (37.8) in length but only had a beam (maximum width) of 9 feet (3.2m). Turbinia was built of very light steel by the firm of Brown and Hood, based at Wallsend-on-Tyne. Initially the vessel was powered Eventually improvements resulted in a top speed of over 34 knots, equivalent to 40 mph (64 kph). Turbinia completed her high speed trials in the North Sea. 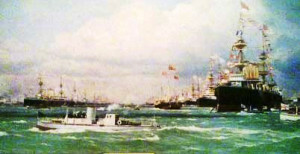 By 1897 Charles Parsons’ Turbinia had proved herself, now all her inventor had to do was sell his new idea to the British Admiralty.In an audacious sales pitch, he arrived uninvited at the Navy Review for Queen Victoria’s Diamond Jubilee at Spithead on June 26th, 1897. Among those present would be the Prince of Wales, representing the Queen, Lords of the Admiralty, as well as a complete cross section of the British establishment of the time.